If elegance is all you can think about when saree is mentioned then you havent experimented enough. 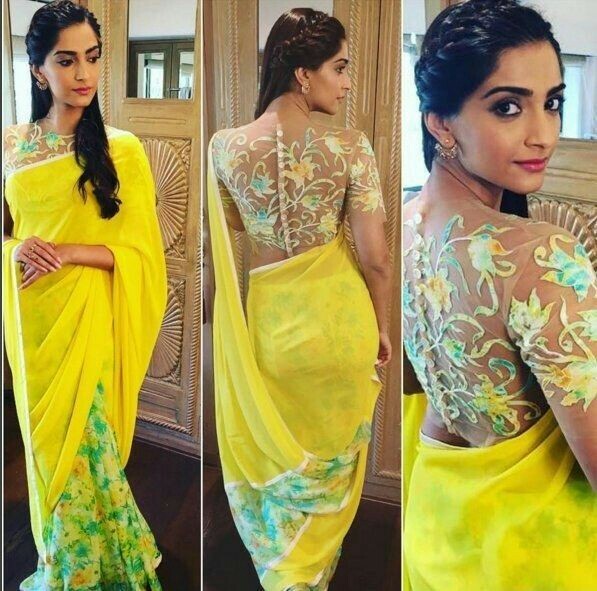 Sonam makes saree look funky with a fun printed saree and a peter pan collar neck blouse design. This kind of designer blouse is ideal for parties like cocktail night. Funky prints are totally in and you can try them even in your blouse designs. 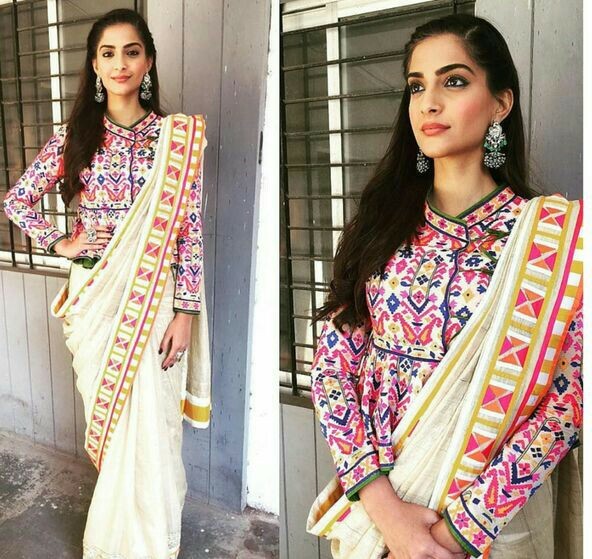 Sonam totally makes this cow print blouse design work with the teal green saree. Go for interesting prints or motifs like peackocks in your blouse designs and pair with plain sarees for an interesting look. If you want to play safe go for simple floral prints. 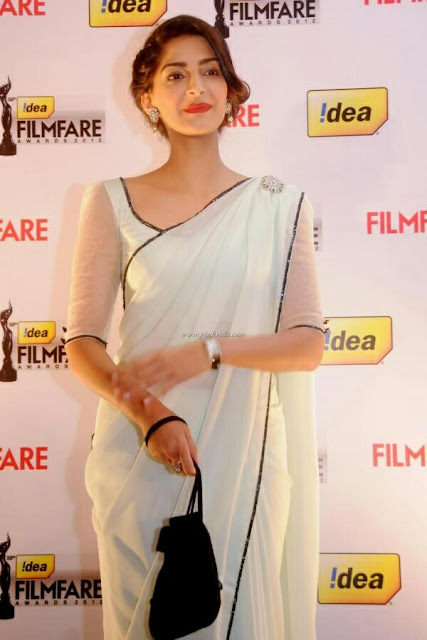 Trust sonam to keep things interesting even in a floral saree where she wore a embellished backless bib blouse. If you want to flaunt your back this is an amazing blouse design to choose. If you dont want to show your belly go for a peplum style saree blouse design which looks elegant and hides your problem areas too. This fusion saree look is sure to deamnd attention but you need to try this look in winters . 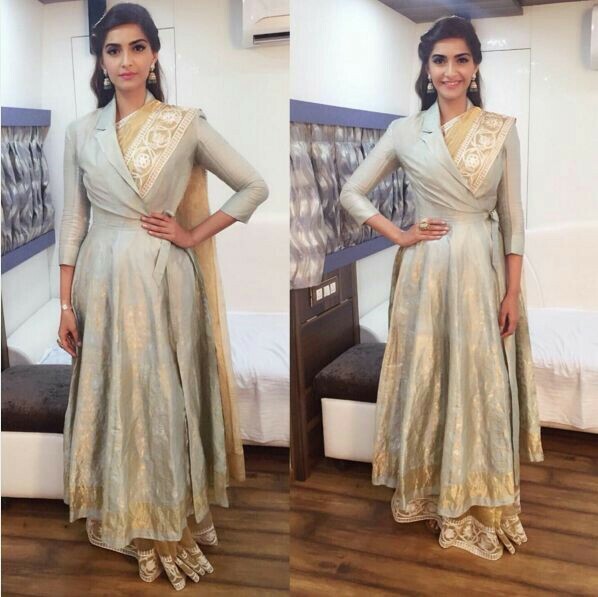 At Cannes Sonam made heads turn in an anamika khanna saree which she paired with floor length jacket style cape blouse. For a winter wedding this such an apt blouse idea. What say? 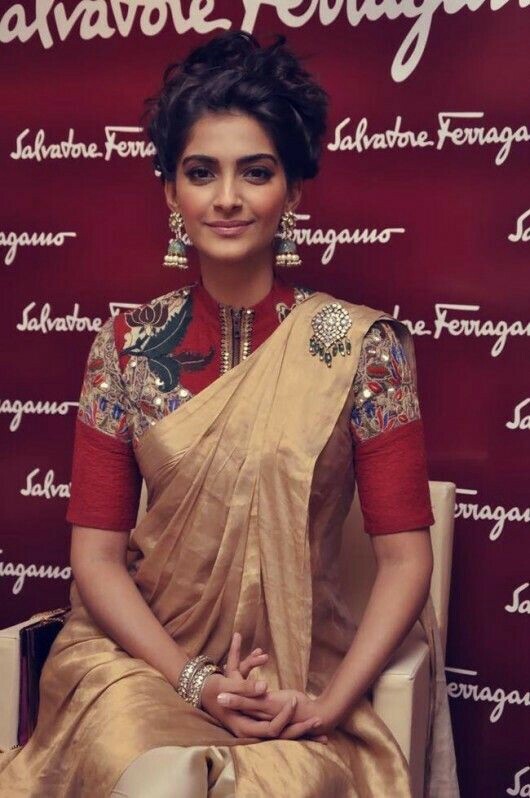 Even youngsters can carry off the full sleeves high neck blouse design and Sonam kapoor shows you just the rigt way to do it. Use a bright colour and experiment with the neckline for a elegant winter saree look. Neon saree blouses look chic and vibrant. Pair with a contrasting saree and keep the styling simple and let the colours shine. I love how this blouse design has elbow length sleeves, the are such a rage these days. For a stunning party saree look go for an embellished high neck blouse design and avoid heavy jewellery. Party the night away without worrying about accesories or being consious of your deep neck blouses. Perfet blouse design for coctail parties, sangeet and mehndi events. Alluring angrakha jacket gives your saree look a very formal feel. You can ofcourse wear this kind of blouse designeven to events and parties becuase the jacket has some glam in. I suggest you pair it with a blingy saree for winter wedding events. Super modern blouse design featuring a fancy zipper in the front is a must have in wardrobe of every young desi chic. If you want to try latest saree blouse designs go for a corset style blouse which are super in trend. They look elegant and help you stand out. Contemporary and chic, this mirror work blouse is all things pretty. You can wear it to a party or even a wedding becuase it has a traditional front and a fun modern back neck design. Most designer blouses are elaborate and fancy so it is better to pair them with plain or simple sarees. Most designers sell blouses and sarees separately. It always a good idea to shop for blouses from high end stores and pair them with normal sarees for an appealing trendy look. This way you will not be spending too much money on designer pieces as sarees cost a lot more than blouses. Designer blouses are a good investment as you can pair them with a variety of sarees for new looks. Go for muted colours to get most out of your designer blouses. You can ofcourse get designer blouse stitched from your trusted tailor. Make sure you give him clear instructions and show photos for refrence . Having inbuilt bra cups is best with designer blouses especially if they are backless. Pay special attention to the lining of your blouse. Opt for a comfortable lining on embellished or embroidered blouses for fuss free wear. If you are using a karigar to get embroidery or work done on blouse go heavy on sleeves and go for light work on the neckline and back. This way you will have a pretty blouse and save money too. Style your hair smartly and let the blouse peek out and flaunt itself. If your designer blouse has pretty back go for soft buns. If your sleeves are highlight go for pinned back open hair . Say bye to those boring blouse, take inspiration from style diva Sonam kapoor and flaunt a designer blouse this festive season.